The Circus Maximus was the largest of Rome’s ancient entertainment venues, at over two thousand feet in length. It was used for both general celebrations and chariot races. The circus is located in the valley between two of the city’s seven hills, the Palatine and the Aventine. It was also the earliest of the great Roman circuses, and others later copied its design. The spot is now occupied by parkland. 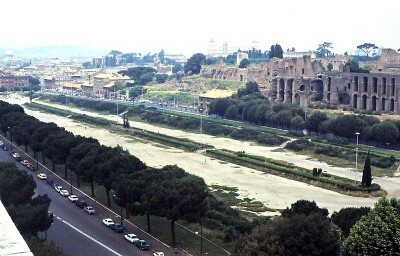 The valley was used for agriculture in Rome’s early years, and the first races were held in little more than open fields. The early Etruscan kings gradually improved the venue, adding wooden seats and awnings for the upper classes. Tarquinius Superbus authorized the addition of seats for plebeians. Additionally, the land was partially drained. The first permanent structures at the circus were probably the three stone turning posts, which were distinctively cone-shaped. At the beginning of the Republican era, in the early years of the fifth century BC, the ruler Valerius Maximus is known to have watched chariot racing here. He was granted a chair, but it would be another three centuries before even the senatorial class could expect stone seating at track-side. By this time, starting stalls were well established; these brightly-colored structures were erected in 329 BC, and were positioned in a staggered style so as to allow for the curvature of the first bend. There were 12 stalls by the time the circus reached the height of its grandeur. In around 50 BC, Julius Caesar ordered a substantial renovation of the circus. Many more seats were added, bringing the total capacity of the venue to about 150,000. Of these, about one-third were reserved for members of the equestrian and senatorial classes. A serious fire caused damage to the wooden seats in 31 BC, although the circus returned to operation with relatively little delay. The track was now over 2,030 feet long and almost 390 feet wide. Drainage was also dramatically improved when a canal was cut around the perimeter of the track. The Emperor Augustus, having repaired the fire-damaged seating, added an obelisk and temple to the circus. The obelisk, which was already centuries old, was imported from the Egyptian city of Heliopolis. Augustus intended it as an imposing reminder of his recent triumph over the Egyptian allies of the Romans he had defeated in the civil wars. The temple, which was likewise enormous in scale, was raised much higher than the seats at track-side. On occasion, the emperor, and sometimes also his close family, would watch proceedings from there, seated among the statues of the gods at the temple. Claudius further improved the circus’s drainage, but further fire damage was caused in 36 AD and again in 64 AD. The latter fire, during Nero’s reign, spread rapidly and eventually caused the destruction of large portions of Rome itself. The circus was rebuilt and continued to host festivals and games in the meantime. In 81, an arch to Titus’s honor was erected at one end of the circus. Shortly afterward, Domitian ensured that his new Palatine palace was so situated as to allow him to look down on the games from there. Trajan, concerned by the repeated fires, decided to use only stone to rebuild the circus. This was the final major change to the structure, which continued in heavy use for many hundreds of years, although Caracalla did make changes to the starting area. Racing ceased in the sixth century, after which the circus began to decay; this was exacerbated by the removal of its stones for other projects. The obelisks survived until 1587 when they were moved by Pope Sixtus V. The first modern archaeological excavations took place in the 19th century, although these have been hampered by the site’s extensive water logging.